If you find yourself increasingly drawn to sliding barn doors, deep kitchen sinks and shiplap everywhere, just blame it on HGTV. With shows like Fixer Upper and Property Brothers running round the clock on the popular cable channel, HGTV has almost single-handedly led to a resurgence in the classic farmhouse style. The channel even features a show called We Bought the Farm. Looking to give your home exterior a simple, no-fuss look and a dose of down-home charm? Few things capture that aesthetic better than a farmhouse-style approach. To get the look right, here are some of the top signature elements of farmhouse style. The farmhouses first built in the 1700s were the original Fixer Uppers. Often boxy and utilitarian, these homes were built by the farmers who needed them, without the help of an architect or engineer. As a result, farmhouse style homes are generally simple and unfussy, and that extends to the roofline. Gable or shed roof styles are quite common in farmhouses. A gable roof consists of two parts of equal size angling down from a central ridge, creating that familiar triangle face front. A shed roof—sometimes known as a lean-to roof—is flat roof that slopes steeply in one direction and may lean against another wall or building. Once consigned primarily to sheds (hence, the name), shed roofs have recently come into their own as a popular choice for homeowners seeing an industrial/minimalist look. 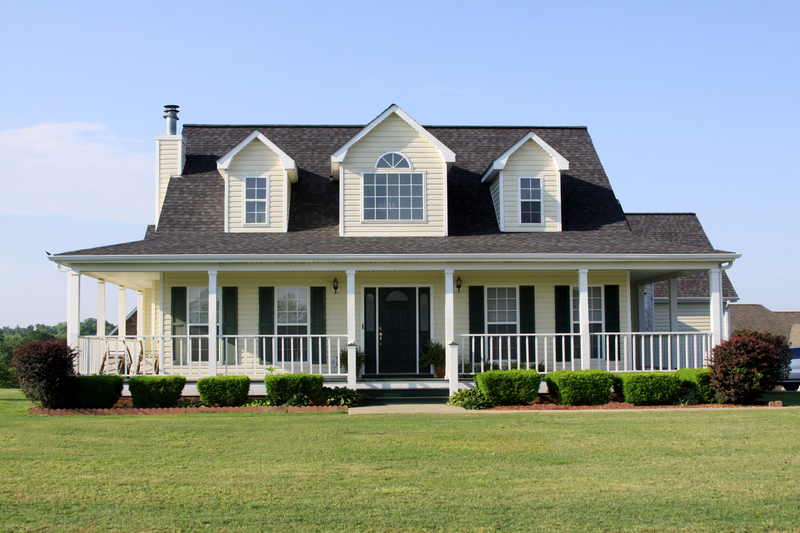 One popular variation is a gambrel roof, aka a “barn roof,” which features two distinctly different slopes on each of the two symmetrical sides, with the upper slope having a shallow angle, while the lower slope is steep. As for materials, with its ability to easily shed snow, ice and rain, metal roofs have long proven to be the most durable, practical roofing material for farmhouses, with shake-style shingle roofs running a close second. Read: Shake up your roofing: What is Shake-Style roofing? Close your eyes and picture a classic American farmhouse and odds are you’re envisioning a white exterior capped with a dark gray or black roof—nearly identical to Grant Wood’s iconic American Gothic painting. American farmhouse style is exemplified by white board-and-batten siding, which features large wooden boards (the “boards”) with thinner wooden boards (the “battens”) running vertically at equal spaces and covering the board seams. This method allows for the natural contraction and expansion of wood during extreme weather conditions. Today’s board-and-batten siding options include a wide array of sturdy materials for farmhouse lovers to choose from, including metal, engineered wood and vinyl. Shiplap is another farmhouse siding option familiar to those who watch Fixer Upper. Traditional shiplap features wide, horizontal wooden planks with a notch (or “rabbet”) cut along each side of the plank. When assembled, the planks interlock and form a snug, protective seal without the overlapping planks you see in traditional siding. Because farmhouse style has evolved over the years as homeowners moved from the farms and to more urbanized areas, there is no one classic farmhouse style window. “As industries other than farming developed in the United States, people moved farther from the fields and into larger towns. When they did, they took the architectural characteristics of the farmhouse with them, which helps explain why so many rural enclaves look so similar,” according to Realtor Magazine. However, what is commonly found on farmhouses are tall, narrow windows that let in lots of natural light, open up the house to the large, traditional porches found on farmhouses, and allowed those original farmers to keep an eye on their land and herds. Many farmhouse style homes have windows that extend from the floor to the ceiling and feature a simple, dark frame and trim. Farmhouse style windows are often double-hung, which means they have upper and lower sashes, and are two-over-two style, meaning two panes of glass on the top and two on the bottom. Original farmhouses featured wide openings and doorways that allowed large families and farmhands to move easily among the community rooms and towards the kitchen, the heart of the farmhouse home and farm life. Those wide openings and doorways appeal to today’s farmhouse lovers who want a similar sense of community and gathering. Sliding barn doors are another popular feature in today’s farmhouses, allowing homeowners the flexibility to close off rooms. “This popular trend shows no sign of slowing down. The X detail on this sliding barn door adds a bonus farmhouse touch,” writes design website Houzz. The Dutch or stable door (also known as a split door) is another door style that works well in a farmhouse home, particularly as a kitchen or even front entrance door. Practical and versatile, Dutch doors were originally used as a way to let light and air in while keeping farm animals out. A common feature among farmhouses, a large front porch was practical as well as decorative. A porch was an extension of the main living space, a place to leave muddy work boots before a farmer came inside, and, in those pre-air-conditioning days, it was also a place to catch a cool breeze on a hot day. Ready to jump on the farmhouse style trend? Let’s work on your home improvement project together. Contact Long Roofing at 844-602-LONG or visit us online to request an estimate. We’re happy to help make your fixer upper the home of your dreams.